The top of your fundraising pyramid is just that -- a small, concentrated piece of your whole universe, made up of older, rich donors who, though important, won't be able to add to the strong foundation of your future fundraising efforts. While they’re reliable for contributing large sums of money to help you reach your yearly goal, they are high risk, high reward from an investment of time and resources perspective. If the answer to both of these questions is no, then your organization needs to do some soul searching, and you need to adjust your current strategy so the answers are unanimously yes. But, have no fear! Here are a few suggestions for how you can shift your focus and turn those shameful "no's" into loud, confident "yeses." Strengthen and grow your core. No, I’m not talking about doing more crunches at the gym. I’m talking about the core of your fundraising pyramid -- recurring and annual donors -- consisting mostly of the Millennial (20-35) and Gen-X (36-50) generations. This is the most important part of your fundraising pyramid to focus on to guarantee sustainability for your organization in the long run. 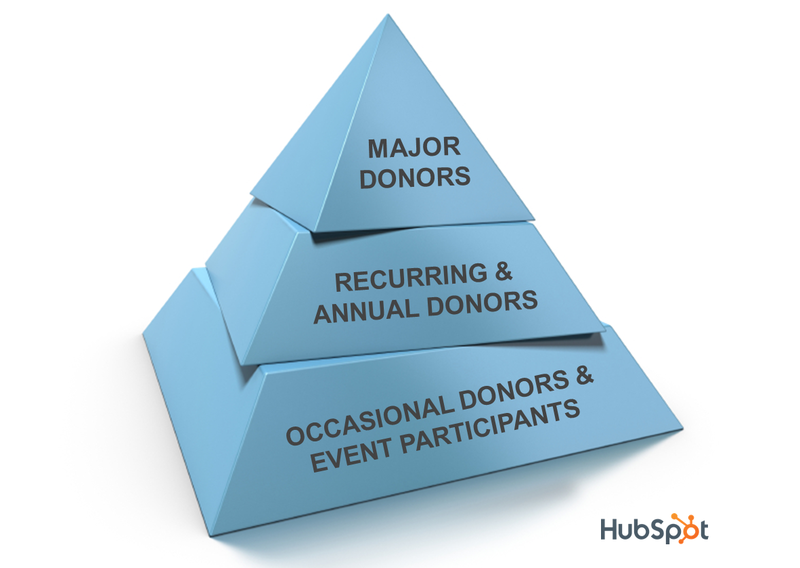 These recurring donors are providing the most consistency and security for your nonprofit. They are giving often and in larger amounts than the bottom of the pyramid, your base, or occasional donors. Your core is showing commitment to your organization, and as they get older, their wealth will grow along with their donation amounts. Start a tiered incentives program for your core. Based on how much they pledge each month or year, these incentives are a way to say thank you to your core constituents. They can be anything from a direct thank you on Facebook or Twitter, to free tickets to your annual gala, to a trip to a project site in the field. Giving them something they can boast about is even better, because their friends and family will want to get involved as well, growing your network through theirs. Communicate and share impact on a consistent basis. The number one thing donors say nonprofits do poorly is to show and communicate the impact of their donations. By sharing exactly where the money they are giving is going, you’re able to engage your donors consistently over their lifetime. Keep them updated on your fundraising initiatives and share pictures of projects in progress or recent endurance event results. Send them an email with this information that corresponds to when they make their recurring donation (monthly, quarterly, yearly). This can easily be done with any email service provider, a well managed donor list, and some writing skills. Ask them for something other than money. That’s right! Ask your donors for something else besides another donation. While a majority of these individuals don’t have that much time to physically volunteer, they could have professional skills, whether its public relations, accounting, or design, that your organization could use for upcoming marketing and fundraising campaigns. Who wouldn’t want to do what they do best for a good cause? Its great for a young professional’s resume, and it’s great for your nonprofit. Don't focus on the dollar. Simon Joyaux said it perfectly: "The fundraising pyramid focuses on the rich. The pyramid devalues people. Ascending the pyramid forces fundraising into a particularly narrow focus, big bucks -- and only the rich have those big bucks." How about this wild idea? 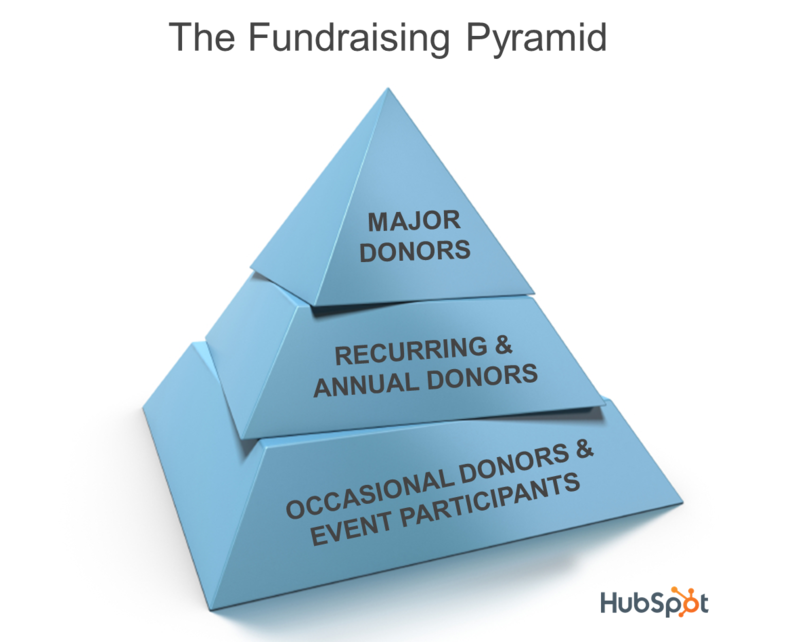 Invert the fundraising pyramid. This shifts the focus to your "base" and "core." Now you’re forced to focus your marketing and development on engaging, inspiring and cultivating these NEW relationships with MORE people. They will naturally move down the inverted pyramid, and over their lifetime, become those major, rich donors that you know so well. If you focus on building the relationships with these individuals, sharing stories they can relate to and providing information they are looking for, you will be indirectly affecting the dollar. If your marketing and communications are the same for your major donors as they are for your core and base (i.e. personal, appreciative, direct, and informative), the connection with them will be much stronger. Using inbound marketing tools like email, your website, and social media makes it easier to manage and execute these tactics to larger groups of donors, while still keeping it personal. Try this: Take the last thank-you letter you sent to a major donor, and read it as if you were sending it to everyone but your major donors. Does it still work for the intended audience? Sure, you’ll have to personalize the donor's name and take out that inside joke, but 9 times out of 10, it works. Now add a line or two about how these individuals are the core of your organization, include an update on an initiative they are contributing to, and send it out. Do the same for new and one-time donors. Make them feel special, like you can’t do it without them. Doing so on a consistent basis will help maintain these relationships for the long term and keep your donor retention high. Offer more ways to give. Yes, your major donors are much more comfortable writing your organization a check, but Millennials and Gen-X’s are not. They want a simple, fast, virtual way to contribute to your organization. Whether it's adding a 'Donate Now' button to your website or offering peer-to-peer fundraising for your events, your core and base want options. If you have different ways for your constituents to give, but you aren’t seeing results from specific channels, make sure you’re clear in your marketing that there are various ways to give. Put the top two options you prefer your core and base to give in your email signatures and on your homepage, linking to a page with all the other options. Don’t make it hard for those who want to give to do so. If your marketing and development teams aren't sitting near each other (if not, side-by-side) and speaking on a consistent basis, they should be. Marketing and development are dependent on one another; Development needs Marketing to drive new prospective donors and volunteers, while Marketing needs Development to keep those constituents engaged so they donate over and over again to fund the organization. More importantly, bringing these departments together will be essential to keeping your strategy consistent for all parts of your fundraising pyramid. Marketing will be able to focus on growing the base and core, while Development will be able to focus on keeping them engaged, as well as nurturing them into major donors over time. Eliminating any silos between these departments will be the key to making these changes efficient and effective, and allow for avenues of constant, open feedback. Extending the life of an organization and spreading awareness of the mission is an important goal of every organization. So why invest a majority of your time and resources on the smallest group of people with the smallest potential of growth? Invest in the future of your organization by investing in those individuals who will get you there.